The Logic Supply crew happily welcomed the Essex High School Robotics Team to our South Burlington headquarters on Wednesday. Roughly 30 of us crowded around as they demonstrated their custom-engineered robot. 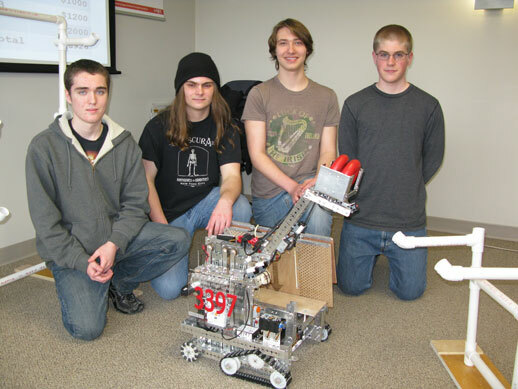 The team (and their robot) partook in this year’s FIRST Tech Challenge. FIRST (For Inspiration and Recognition of Science and Technology) was founded in 1989 to inspire young people’s interest and participation in science and technology. This year’s competition game was an extreme version of tic-tac-toe. The teams required a strong and nimble robot to move donut-like rings onto a nine-piece hanger as quickly as possible, all while averting collisions with the competing team. Each team was sent a box of pieces, from which they assembled unique robots. EHS’s design employed a scoop-like hand to grab the donuts and tank-like wheels to maneuver itself. In the Logic Supply office, the robot–controlled by two team members with Xbox controllers (one for the arm and another for the wheels)–moved with grace from point A to point B as the team showcased their remarkable cooperation. The robot, we were told, had been through quite a bit since (and when) the competition was held in the winter. Still, it managed to perform its duty with very little stutter. Perhaps more impressive than the robot itself was the students’ ability to articulate themselves. Confident in their design and subject knowledge, they stood before a room of professional engineers and tech junkies, poised to answer a variety of questions. Needless to say, all of us here at Logic Supply were impressed by this group of talented young students. We greatly look forward to hearing about their future plans, and to helping promote STEM Education in the area. Logic Supply Customer, StreamOn, Wins “Cool Stuff” Award!